I’ve already written about how my love of G.I. Joe and Batman comics informed my entry into NOChood. But I’d be disingenuous if I continued to assert that comics are still my nerdiest obsession. Don’t get me wrong, my shelves are still filled with trade paperbacks and graphic novels, and my parents’ house is still full of longboxes that contain issues belonging to me and my brother. But when I think of what makes me a nerd, it isn’t really comics. Or video games. Or sci-fi/fantasy. I can’t believe I just said that, but it’s true. Maybe it’s because I just watched a 60-minute infomercial about the Marvel Cinematic Universe on ABC, but I have to admit that there’s an element of wonder in the Marvel films that just seems to be missing in DC’s live action oeuvre. (Don’t get it twisted, though. I still think The Dark Knight is the be-all in terms of the superhero flick). But for me, it really boils down to one thing: the costumes. From the jump, the self-financed Marvel movies have understood that fans respond well to faithful translations from the page to screen. And in terms of aesthetics, you don’t get more faithful than Marvel Studios1. 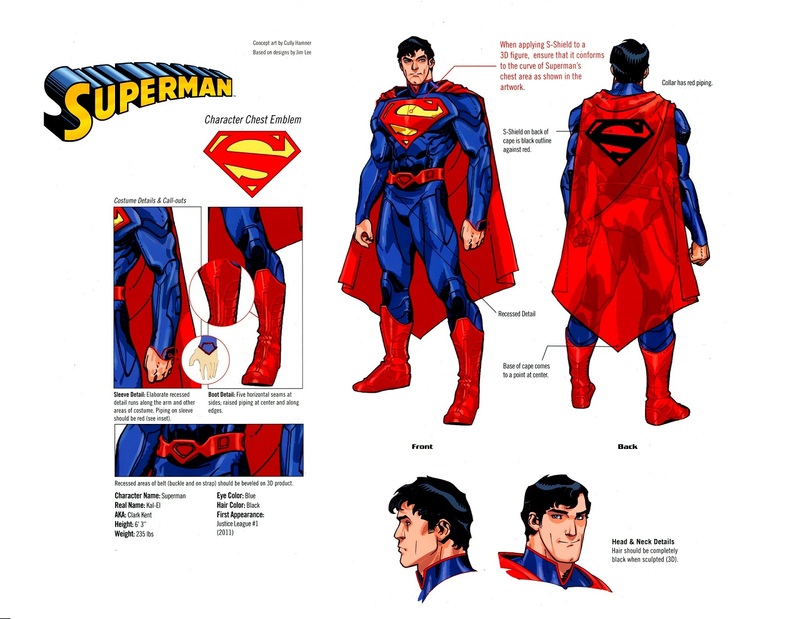 More than the absence of Supes’ underwear, the entire palette of the costume is dulled and muted. This has been one of the major criticisms of the DC/Warner approach to the superhero genre. Sometimes superheroes don’t have to be grim and gritty to be good. My beloved Dark Knight trilogy is not immune either. Raymond has already discussed his issues with the liberties Nolan has taken with the character of Batman, but while I don’t agree with his points completely, I have to admit that I do feel that way about some of the Batsuit design choices in the Nolanverse. In some regards, I actually preferred the Batsuit of Batman Begins to the redesign in The Dark Knight, mostly because the new suit emphasized function over form a little too much. I mean, I’m glad Christian Bale could finally turn his head, but the patchwork armor plating doesn’t really look that great outside the shadows2. It’s not just the movies. Revamping classic costumes and aesthetics was part of the company-wide reboot in 2011 called “The New 52.” Maybe it’s shallow, but these costume changes are one of the (many) reasons I’ve (mostly) stopped reading DC books. Three years later, I’m still not a fan. I’m hoping this look will eventually go the way of Superman Blue and Superman Red. I have the sinking feeling that won’t happen, though. For the last two seasons on The CW, the show Arrow has, mostly, followed in the Nolan/New 52 aesthetic, taking pains to build a gritty, realistic urban landscape for its vigilante hero to save. 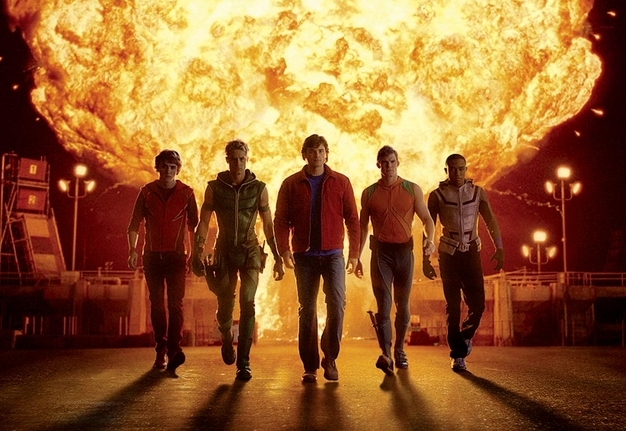 First season Arrow was also similar to other live action DC adaptations in that it seemed to shy away from its comic book origins; instead, eschewing the fantastic for the realistic. This season, however, it seems that the writers behind the show have given up the ghost and fully embraced the source material. 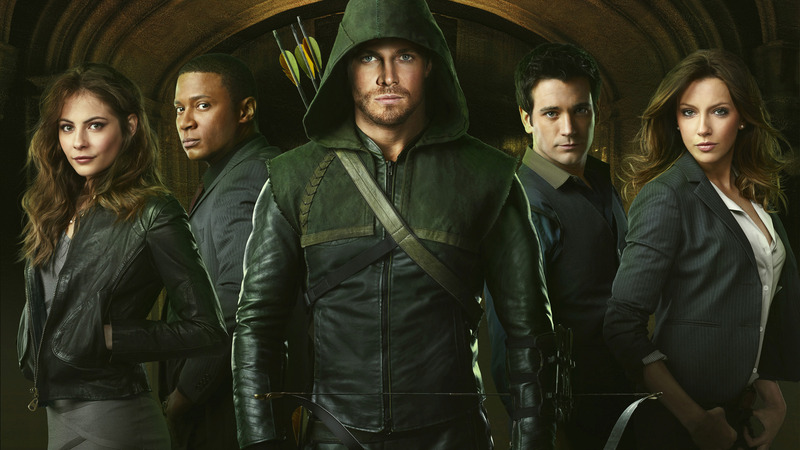 With the introduction of so many costume-clad heroes and villains — including Black Canary, Deathstroke, and the League of Assassins — tuning in to Arrow every week is starting to feel like cracking open an issue on every New Comics Wednesday. Hell, Ollie has even started sporting his signature domino mask this season! Though the show still has its darker elements, it’s nice to see it embrace its more fantastical elements. The introduction of Barry Allen and actual super powers opens up even more possibilities that even Smallville took years to come to terms with. Still, this acknowledgement of the comic book aesthetic has once again taken a back seat. At least that seemed to be the case when the first images of Grant Gustin as The Flash (in the upcoming Arrow spinoff) appeared online. It looks like the studio has (again) decided that what works in the comics can’t work on screen (though an entire phase of multibillion-dollar-grossing Marvel Studios flicks have proved otherwise). I never understood making them duller and more muted either. 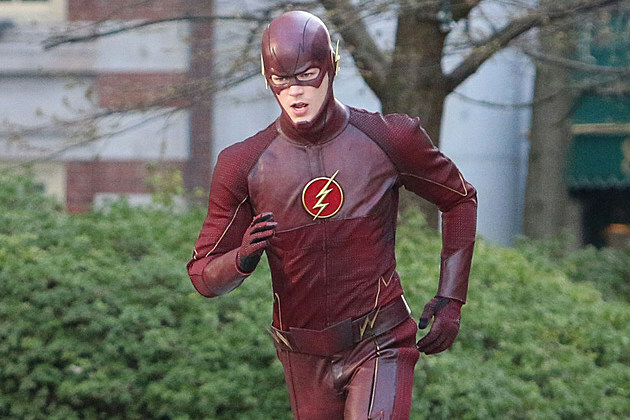 I saw a photoshopped version of the Flash’s new live action outfit done in bright red with a white and yellow logo and it looked great. I think we’re long past the point of thinking that these costumes look “silly”, it’s becoming standard at this point. I’ve heard that the new Batman suit for the next Man of Steel movie is supposed to be much closer to a comic book version of the suit, but time will tell on that front. The new Flash costume makes him look like a lackey for Ming the Merciless. He’s more space opera than Earthbound superhero. 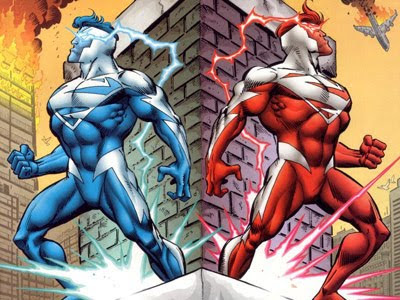 I miss the flamboyancy of the DC superhero costume because they each were a signature of the character’s personalities. Duller, muted colors take away the pizzaz, and it doesn’t help to rarely mention their superhero codenames too. I disagree with everything in this post. Here’s the thing: Marvel might be doing more movies but that doesn’t make them better. I would take the Dark Knight, Man of Steel, or Watchmen over any Marvel movie any day of the week. That being said, WB/DC still has a long road ahead of them. Man, you got it wrong on so many fronts in this post. It’s just sad. The suit in Man of Steel was damn near perfect and I’m glad there was no underwear or unnecessary splashes of yellow throughout. 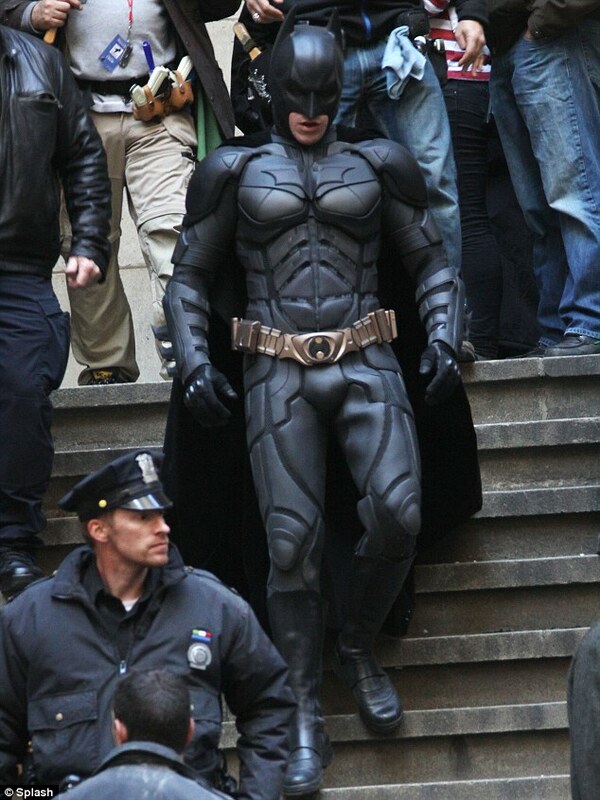 The same goes for suit in The Dark Knight movies. Of course Batman is going to wear black armor if he wants to be stealthy and not get lacerated. And as for your comment about comic book movies not needing to be dark/gritty to be good, I couldn’t have facepalmed harder. The vast majority of comic book movies these days are lighthearted fare (thanks to Marvel), which is not inherently bad. But then you get a movie like Iron Man 3, which is enjoyable enough but ultimately empty and meaningless. And the worst part is that it was deliberately marketed as a dark, thoughtful, epic film. It was none of those. So are you really going to complain about DC taking comic books seriously? You’ll have 3 Marvel movies a year that will be complete laugh-riots, and you really want to whine about somebody doing thought-provoking character studies using some of the greatest characters in all of fiction? Frankly, that mentality sickens me and I am sincerely worried that it is becoming far too commonplance. There is a place in this world for MCU movies, but they shouldn’t be all that exist. Also, if you stopped reading comic books because of costume changes, you have no business talking about anything tangentially related to comics. And I am not remotely understanding what’s wrong with the Flash costume. Arrow is one of the best shows on TV, and the Flash is getting a show from the same creators, and all you can do is complain about what is actually a fantastic costume? That’s just sad. Here’s the problem with the authors summation of marvel’s movie costumes. All of those costumes, including Captain America’s didn’t appear in the comics until they were altered for the films. the Thor comic book costume is not the same as the film, neither is Captain America’s current costume. the costume you have in the article only appears for one sequence and is a standard army unifrom, with the exception of the helmet. Iron Man’s armor was changed in the comics after the first film came out as well. So it’s actually the reverse of what you claim. Scott Bukatman wrote an interesting chapter in “Terminal Identities” which can be applied to the costume modifications of today’s live-action superheroes. The ‘armor’ approach that’s been done to Batman and Superman is pretty similar to attitudes towards famous science fiction cyborgs. 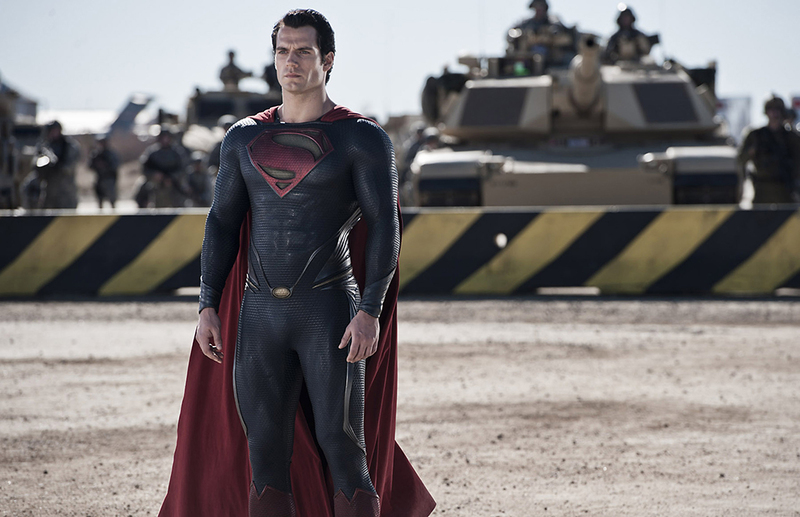 Looking like a tough fighting machine is preferable to looking like a candy wrapper (even the Man of Steel costume looks like chain mail – the rational fairly contrived). 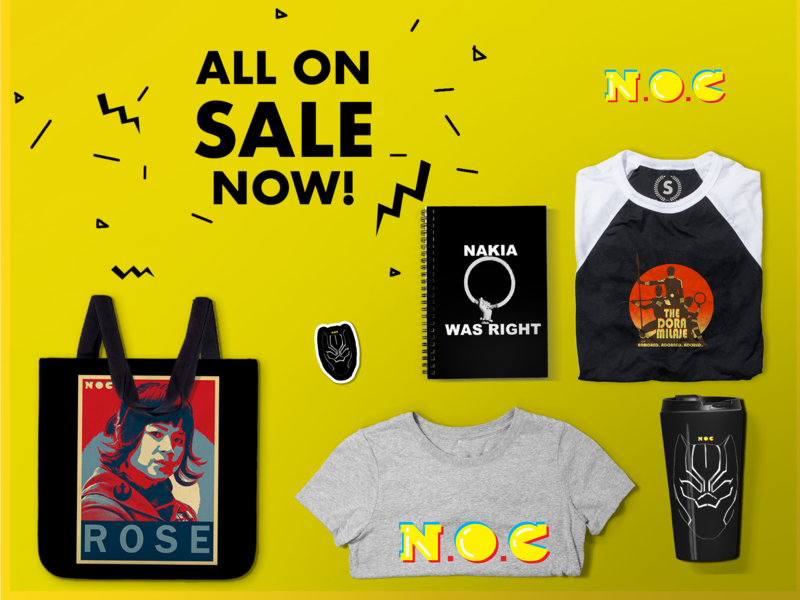 We already have lots of fans who love dressing up as Halo soldiers, Umbrella mercs, Star Wars Storm Troopers, the Terminator, and so on. Another way to apply Scott Bukatman’s analysis is the utilitarian approach to movie costume designs. Making it look more functional than flambouyant informs the audience the hero is more prepared for battle. It’s a matter of time before we think superheros should act more like righteous automatons restoring order. Their only saving grace will be the humanity we see in their secret identities.